Laindon High Road School. Believe picture dates to 1963 ? Valerie Boatwright and Denise Allen the only “girls” I can identify. Unsure as to the teachers name, was this Mr. Durrant? Mr. Bear? p.s. Valerie and Denise were almost conjoined twins, they were that close ! Editor: The teacher is definitely Mr Bear. 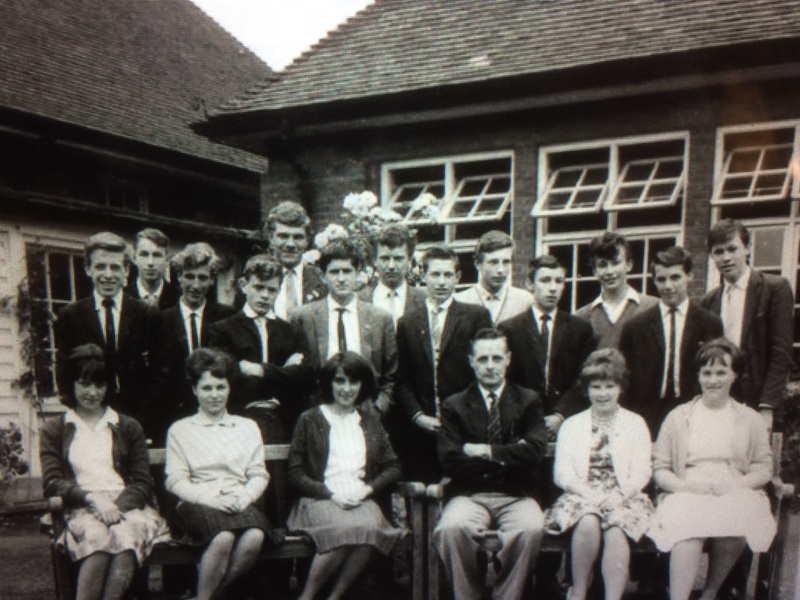 To anyone who was at Laindon High Road School between around 1958-1963 and remembers Eric Cowell. Sadly Eric died in Glasgow on 29 March 2018 after a sudden illness. Please email for further information. Think the third girl from the left is Rosemary Rawlinson. Funny looking at this photo and seeing Geoff Simmonds reminds me of a Saturday night out with him and two others in Southend in September 1963. We left Laindon Station and headed for Southend Central , four 16 year old lads out for a laugh. At the Kursaal we met two or three good looking girls down from Cambridge. On the rides I paired off with Geoff and two of the girls. We spent the whole evening with them, doing the normal stuff kids do just after leaving school as we has done that July. At about 10pm the girls had to return to their coach which was going back to Cambridge but we got on with them and asked the driver to take us to Laindon first. He did, it was a great ride back and we said our goodbyes at the Fortune of War where the bus turned and headed presumably to Chelmsford, Braintree and then through to Cambridge. I remember how brilliant that night was, so innocent and with such a good friend, I wonder where he is now? As described, Valerie Boatwright and Denise Allen are to the right of the photograph next to Alan Bear. The three girls sitting next to each other have names which escape me, I think one is called Rosemary or Rosalind but not sure, my 70 year old brain not quite as sharp as it was, I recall this day though because we did another photo of form 5x which includes myself, this class I believe is 5x(2). Richard, thanks for filling in some of the missing names, names that had escaped me. However there are 3 or 4 names that I am totally unfamiliar with, nor am I aware of how I came to have a copy of the photograph as I left in ’62. I can see many old friends, Geoff Schroeder, David Shirley, Mick Blackery, John Kingsley, Joe Borowski, Paul Robson, Robert McMasters, Dave Gowlett, Terry Stolworthy, Micky Bryan, Geoff Simmonds, Arnold Grant (his sister Margaret Grant was cute) Geoff Pepit. Teacher was Mr Bear I think this is July 1963.